This Traditional combines beautiful low-maintenance siding with bold columns and multiple gables, creating drama and appeal. French doors, windows and an open floor plan allow this home to be airy and bright. Strategically placed columns define rooms without enclosing space, and the bonus room works perfectly for a home theatre. 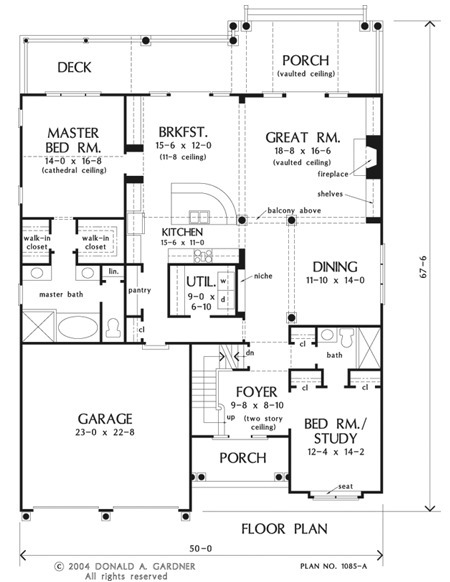 1st Floor: 2172 Sq. Ft. 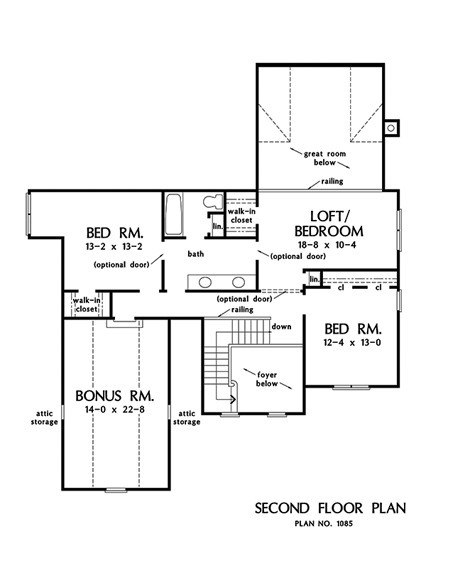 Bonus Room: 337 Sq. 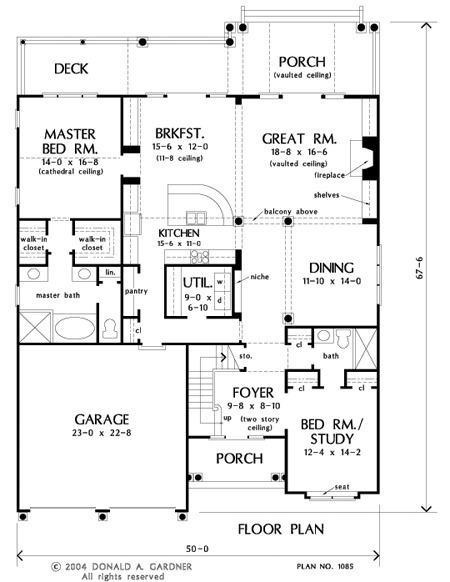 Ft.
House Dimensions: 50' 0" x 67' 6"
Great Room: 18' 8" x 16' 6"
Master Bedroom: 14' 0" x 16' 8"
Foyer (2 Story): 9' 8" x 8' 10" x 18' 1"
Dining Room : 11' 10" x 14' 0" x 9' 0"
Great Room (Vaulted): 18' 8" x 16' 6" x 18' 1"
Kitchen : 15' 6" x 11' 0" x 9' 0"
Breakfast Room : 15' 6" x 12' 0" x 11' 8"
Utility Room : 9' 0" x 6' 10" x 9' 0"
Bonus Room : 14' 0" x 22' 8" x 11' 0"
Master Bedroom (Cathedral): 14' 0" x 16' 8" x 12' 2"
Bedroom / Study : 12' 4" x 14' 2" x 9' 0"
Bedroom #3 : 13' 2" x 13' 2" x 8' 0"
Bedroom #4 : 12' 4" x 13' 0" x 8' 0"
Porch - Front : 13' 4" x 6' 0" x 9' 9"
Porch - Rear (Vaulted): 21' 4" x 10' 10" x 13' 7"
Deck / Patio : 15' 4" x 8' 0" x 0' 0"
Loft / Study : 18' 8" x 10' 4" x 8' 0"